The American Metalcraft MH243 tabletop card holder is ideal for holding menus and table numbers with its wire loop clip. 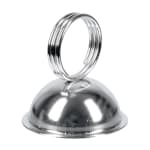 Its nickel-plated construction adds durability to support commercial use. A sleek, stylish look is provided by the mirror finish. With a 21⁄2-inch height, the card holder has a low profile. "These came exactly how I hoped they would. They are a great price point as I needed a lot. They hold small cards all throughout homes for us an..."
"These table card holders worked perfectly. I placed large pictures in them and placed them as center pieces. Worked great!!" "These came exactly how I hoped they would. They are a great price point as I needed a lot. They hold small cards all throughout homes for us and looks great!"